Dupuytren's disease is an inherited, non-painful condition that affects the hands of adults. It results in abnormally thickened tissue that forms nodules or cords in the palm and/or base of the fingers. The cords contract over time, drawing the fingers in towards the palm and preventing you from being able to straighten your hand properly. In anatomical terms it is the "palmar fascia" that thickens to form the nodules and cords; this fascia is a tissue layer that lies directly under the skin of the palm. Dupuytren's disease warrants treatment when you can't put your hand flat on a table top and have difficulty using your hands for everyday tasks. It is sometimes called the "Viking's disease" because it is more common in people of European (and Viking) descent. Dupuytren's disease tends to affect people aged over 50 and is gradually progressive. People who are affected in their 30s and 40s tend to have a more severe form of the disease, sometimes termed "Dupuytren's Diathesis". Women tend to be affected a decade later than men. Dupuytren's most commonly affects the little and ring fingers, but it can also affect the middle finger, index finger and thumb. Dupuytren's disease is gradually progressive and no treatment cures the disease. However, very effective surgical and non-surgical treatments are available. If you are in your 60s or 70s when you first notice this condition you may require only one (or no) procedures during your lifetime. If you are in your 30s or 40s it is highly likely you will require more than one procedure during your lifetime. Dr Tomlinson presented on "21st Century Treatment of Dupuytren's Disease" at the Epworth Hospital Grand Rounds in 2016. To view this presentation click here. Injection of corticosteroids is useful for tender palmar nodules. 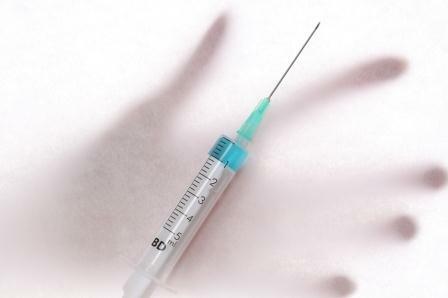 These injections can also be used in combination with needle fasciotomy. Splinting of the hand can be tried at any time, but generally it is not effective as a sole treatment, particularly once you have trouble straightening your fingers. Needle fasciotomy and injectable collagenase treatment are effective non-surgical treatments that we can offer to the majority of patients. Surgery is recommended once the condition interferes with your daily activities and you cannot place your hand flat on a table top. In the video below Carolyn Kerrigan describes the surgical options of fasciectomy and needle aponeurotomy. Surgery is an effective therapy that is usually performed under general anaesthesia as a day case procedure. Zig-zag incisions result on the palm of the hand and/or fingers over the cords. The thickened and abnormal tissue is excised and the incisions closed. If the palm has been severely contracted for a long time it may be necessary to have skin grafting performed as part of the procedure but this is avoided unless necessary. The recovery period for surgical fasciectomy is a period of weeks. If the incisions heal without difficulty you should be able to return to light duties at 2-3 weeks. If you perform heavy work it will take longer (4-6 weeks). 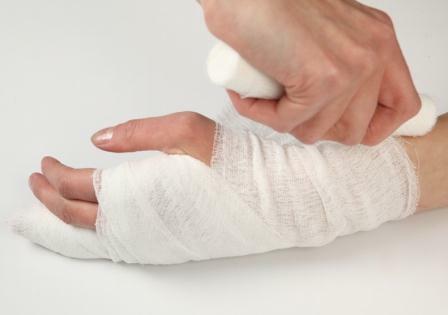 Your surgeon will refer you to a hand therapist for splinting (such as a splint that you wear at night to try to maintain the full range of surgical release), mobilisation exercises and scar management. During the initial healing phase you will need to keep your hand elevated and the wounds covered with a dressing. Needle aponeurotomy is a less invasive approach to treatment that is suitable for many patients, including patients who have had recurrence of their contracture after previous surgery. In the procedure a needle is inserted through the skin at multiple points overlying the cord, and the surgeon moves the needle back and forth to cut or weaken the underlying cord. Because the procedure is done blindly it wise to have the procedure done by a surgeon who is experienced with the technique. The procedure is done under local anaesthetic as a day case procedure (wide awake hand surgery). Recurrence of the Dupuytren's contracture is faster with the needle aponeurotomy treatment, but patient satisfaction is high. Studies have shown a faster functional recovery at 6 weeks after surgery with the needle fasciotomy procedure compared to a fasciectomy. The procedure can be repeated multiple times. A randomised study by van Rijssen published in the journal Plastic and Reconstructive Surgery in February 2012 compared needle aponeurotomy with fasciectomy and found that 85% of patients had a recurrence within 5 years. This study found that older patients were less likely to have a recurrence. Click here to read the article abstract. A randomised study by McMillan published in the Journal of Hand Surgery in July 2012 reported that the combination of needle aponeurotomy with injections of corticosteroid (triamcinolone) produced a greater improvement at 6 months than the use of needle aponeurotomy alone. At Melbourne Hand Surgery Dr Jill Tomlinson performs needle aponeurotomy on a Monday, Tuesday, Thursday or Friday morning. You can see a hand therapist at the practice immediately after the procedure to have your night splint to be made. The main post-procedure restriction is that you need to avoid performing dirty tasks (eg cleaning the toilet or gardening) over the weekend. 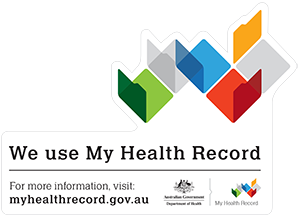 Plus, you are not able to drive home from your appointment after having the procedure - you will either need someone to drive you home or you can take a taxi or public transport. Most people are able to return to work as normal on Monday. After the procedure we routinely review you at the 2 week, 6 week and 3 month stage. The night splint is worn at night for 3 months to maximise the results of the needle aponeurotomy. More detailed information about needle aponeurotomy is available on this page of our website. 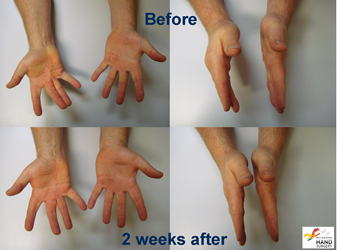 View our patient photo gallery here to see many before and after images of patients treated at Melbourne Hand Surgery. An injection option for Dupuytren's contracture has been developed in the last decade, using an enzyme to digest collagen in the hand. In this treatment an enzyme ("clostridium collagenase", brand name "Xiaflex®") is injected directly into the tough cords in the hand. The enzyme digests collagen at the site of the injections, and 1-7 days later patients return to their doctor for a strenous hand stretch. The aim of this stretch is to rupture the weakened cord, straightening the hand. Collagenase treatment can have complications (as can surgery, and needle fasciotomy). The likelihood of major local complications from collagenase treatment is reduced if your doctor injects the correct amount of the enzyme precisely into the areas that need to be treated. Dr Tomlinson's significant experience with needle fasciotomy for the treatment of Dupuytren's contracture means that she is well versed in assessing the thickness and depth of Dupuytren's cords, and can also advise you if she feels that needle fasciotomy would be a better non-surgical treatment option for your hand. Dr Tomlinson is also able to combine collagenase treatment with needle fasciotomy, which can improve the effectiveness of treatment, particularly in individuals who have multiple areas of the hands involved or involvement of the finger joints. Information about Xiaflex® is available at the HealthDirect website. The medication costs $1345.30 for one vial of the collagenase product and this cost is passed directly on to our patients. Some private health insurers offer a rebate on the cost of the medication, depending on the details of your policy, but the majority do not. To read more about injectable collagenase treatment at Melbourne Hand Surgery, including your initial appointment and treatment pathway please visit this webpage. Treatment with injectable collagenase is generally associated with a greater amount of bruising and swelling than needle fasciotomy/aponeurotomy, and hence has a longer down time than needle fasciotomy/aponeurotomy - but still a quicker recovery time than with open surgery (fasciectomy). Occasionally patients who have had multiple previous surgeries may request amputation as an option to address an immobile, contracted finger. In some advanced cases amputation may be the best option for restoring hand function, but this is very uncommon. While this is offered by some centres for Dupuytren's disease I do not recommend this treatment. The appropriate radiation dose is not clear and I have concerns about the risk of potential long term side effects including nerve damage, intractable pain, dryness, photosensitivity, skin atrophy, reduced wound healing, and cancer. The National Health Service produced a literature review on radiation therapy for Dupuytren's disease in January 2010. It states "There is little systematic evaluation of safety outcomes such as long-term complications relating to irradiation" and "Efficacy outcomes are largely subjective". What can go wrong (complications)? Potential complications of all surgical procedures include delayed wound healing, wound breakdown, bleeding, troublesome scarring, complex regional pain syndrome and incomplete restoration of movement (either due to stiffness or incomplete release of the contracture). Patients who have severe contractures are less likely to regain full movement than if the surgery is done at an earlier stage. There is a risk of injury to nerves, arteries and tendons during the surgery. This applies to both open surgery and to needle aponeurotomy. If a digital nerve is injured this will result in numbness to the affected area. This numbness may be permanent, although some recovery is usually expected with time. If a single digital artery is injured you most likely won't notice any difference, although you may experience cold intolerance if you work in a refrigerated area or live in an extremely cold climate. If both digital arteries supplying a finger are damaged and they cannot be restored the the blood supply to the finger is cut off and amputation may be necessary. This is very unlikely unless you have had multiple previous operations on your Dupuytren's. Subsequent operations in the same area are technically more difficult because of scarring from the previous operations. Sometimes the sensation of your fingers can be numb after the surgery even if the nerves remained in continuity during the surgery. This can be because of stretching of the nerve, or because the blood supply to the nerve has been affected. Generally this numbness will be temporary.